Audi Sport will have 16 cars in its performance car line-up by 2020. It used to be a special occasion when Audi Sport unveiled a new high-performance machine. At one point, Audi's Sport division would build no more than a couple of cars at a time, but that’s no longer the case. This year, Audi Sport has spoiled us with the surprise reveal of the rear-wheel-drive , the , and the . In total, Audi Sport currently produces 11 models including the R8 coupe and convertible, and the TT RS. However, Audi's high-performance line-up is about to expand even further in the next few years following the appointment of Oliver Hoffman as Audi Sport's new Head of Technical Development. Hoffman was previously in charge of powertrain development at Audi Sport, where he oversaw the development of the Audi R8’s 5.2-liter V10. He was also head of quality management at Lamborghini, and is taking over from Stephan Reil who is taking on an unspecified new role at Audi. “With the appointment of Oliver Hoffmann, we have gained a highly qualified manager for the Technical Development division,” says Stephan Winkelmann, CEO of Audi Sport. “With his experience and skills, Hoffmann will help to realize the expansion of the Audi Sport brand.” That expansion is referring to plans to introduce five new performance models to Audi Sport’s range by 2020, bringing the total line-up to 16 cars. 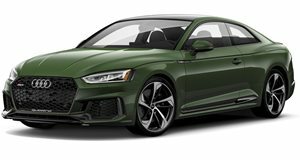 Audi Sport hasn’t detailed what we can expect from the expansion, but rumors have suggested that the performance division will introduce an and convertible, a sedan version of the RS4, and a in the near-future.